The following is a lovely blog sent to us from a couple who stayed at Higher Trewellard Hill Farm in May/June 2010. Summary – Welcoming people, clean and spacious accommodation - ideal for couples. With the skies in turmoil in Spring because of a certain volcano, my boyfriend and I decided we would like to do a Cornwall Cottage holiday. The last time we visited Cornwall we went to the South near St Michaels Mount and we had in particular enjoyed visiting Lands End. For that very reason, this year we sought a cottage which was near this Westerly point. After many weeks of searching, we found Higher Trewellard Farm, the only place in the far West which looked like a decent size, in a decent location for a decent price. Something which is difficult to come by especially when it is the Bank Holiday weekend. Before we went on holiday we were already contacted by [the owner] who wanted to know if there was anything we would require upon arrival, short of a bit of milk and a few tea bags there wasn't a huge amount. However this was a lovely touch and was just the beginning of them showing us how much they cared about their guests. Upon arrival, which turned out to be very late after some bad traffic we were greeted by [the owners] and were given a grand tour of the cottage. Despite us all being very tired, they took a decent amount of time to make sure we knew where everything was and that we would be comfortable for the night. In the morning we found some pretty tasty scones, clotted cream and jam on the table waiting for us from last night, and we made short work of them at breakfast time. In the morning we were shown around our private (well kept) garden in front of the cottage which came complete with a BBQ and patio set if we so wished. Unfortunately with the weather unsettled we never did get the opportunity to use it. We were also given a three page document with all the information you could ever need about the area and the cottage itself. The cottage itself was a decent size, clean, the bedrooms were spacious and comfortable, the kitchen was well stocked for pretty much anything you can think of and the bathroom and shower were so nice we actually wanted to take them home. Internet access was available and just required a passcode which we were given very promptly and there were a wide range of books, DVD's, videos and games for visitors stuck for something to do. As a couple the location was perfect for us, set up on hills it was quiet and picturesque with plenty of countryside to go walking and for those dedicated enough, a small untouched beach in a cove a couple of miles away reachable only by foot. In the mornings you will either see lots of fog from the master bedroom window or a beautiful view where you will see all the way to the sea. In the nearby town which is easily within walking distance you will find pubs/restaurants and a few shops including a fish and chip shop. We would recommend although checking the times as we did find that a lot of places closed early. [The owners] are extremely helpful, friendly and accommodating people and we would happily recommend this property to any one looking for a cottage in Cornwall. Wow... It's a perfect. 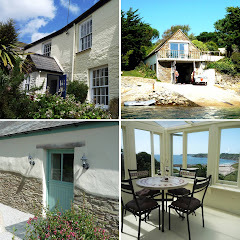 Cornwall holiday cottages are really awesome for holiday relaxation.